birthday | Tiffany Loves Cake! So, this guy, Tony… he’s awesome. 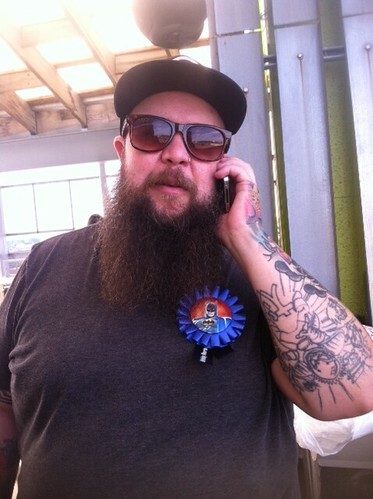 He turned 40 this year and put together a super cool fling for himself. I was to do the cake and I knew I needed to make something very cool for this very cool guy. I think I delivered. 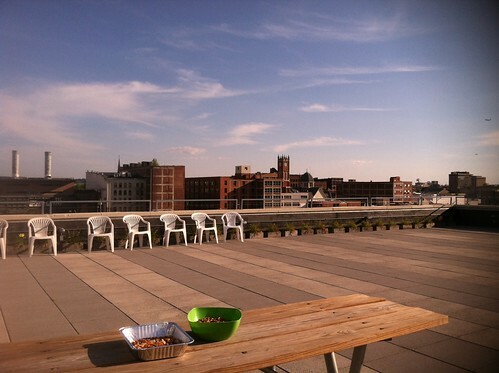 His party was on the roof top of a very cool building downtown with a great view! Hey! I can see my apartment from here! I covered the cake board with a fancy placemat and decided this cake needed to be TWO cakes haha. I brainstormed and came up with some ideas. I mean what do you make a super hip guy with tons of interests?! I settled on a few things. 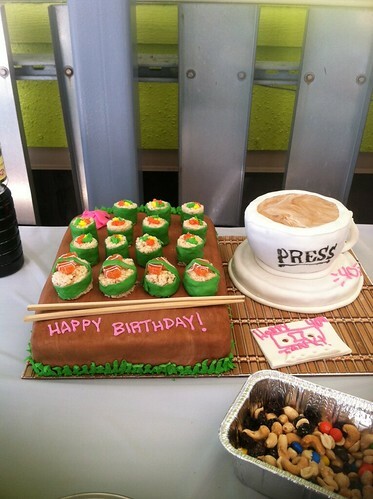 I made a plank of sushi for the large cake which was strawberry flavored. Then I made a saucer and a mug of coffee which was chocolate espresso flavored cake! And a little fondant cassette tape. My niece Sophia is pretty much the cutest thing ever. Posting this now makes me feel really silly because of how long ago this party was, but hey, I’m hopping back on the posting wagon! I have a whole back log of cakes to post! 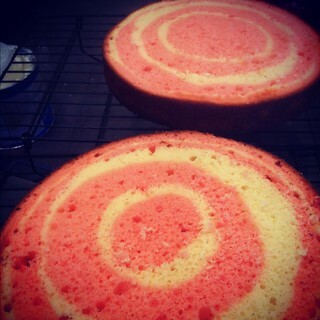 I knew I wanted to do a yummy pink strawberries and cream zebra cake! 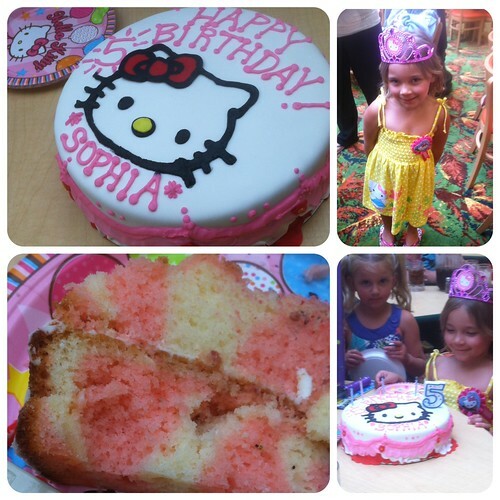 The party was beyond adorable and the cake went great with the decor! My friend’s son needs to stop growing up. It’s making me feel pretty old. 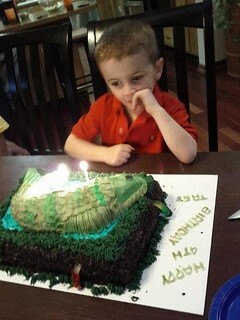 Every time he has a birthday I start to panic that it’s impossible another year has passed!! Addison is five this year. I’m still not sure I believe it. 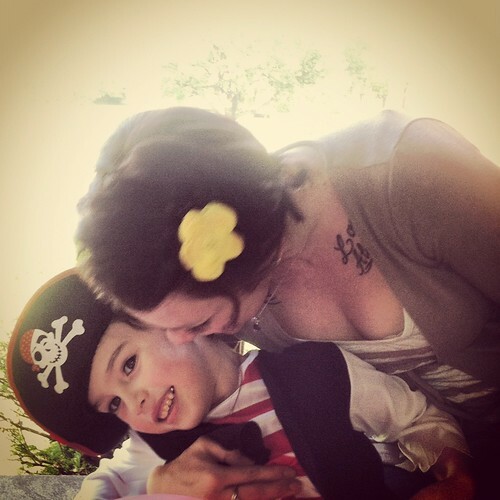 He had a pirate theme party and it was pretty darn adorable. His mom put a lot of work into getting a lot of fun pirate stuff together for him! 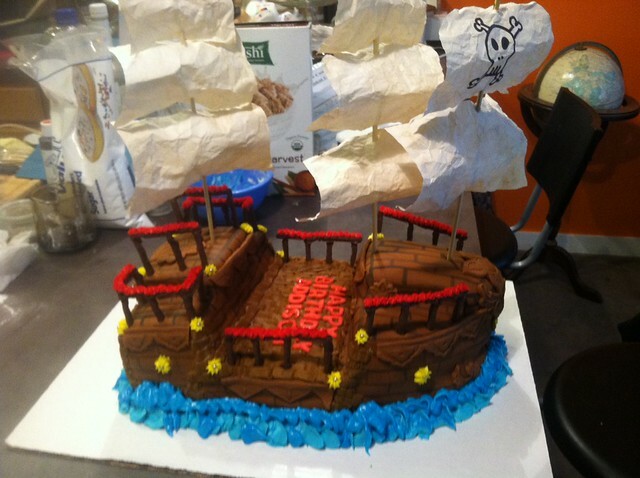 I did this giant pirate ship cake with pretzel stick railings and Hand distressed sails! The whole thing was chocolate! I bet next week she’ll be telling me he’s about to turn six! I think I’ll faint. 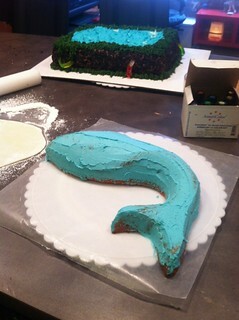 On rare occasion, I’m asked to recreate a cake I’ve made in the past. This was one of those occasions. The last one I made was a huge hit. When I was asked to make a second one, I was concerned a bit. Could I truly recreate something like that? It was one of my favorites and I felt like it really captured a moment in time. 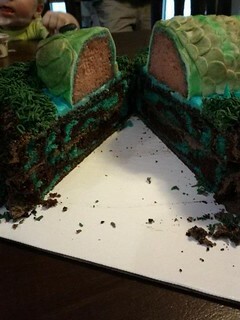 I decided to make the cake, but make it a bit different. 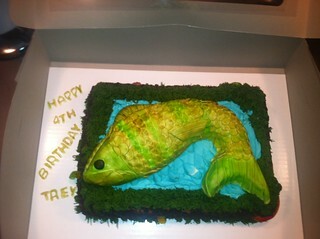 The buttercream transfer for this cake took me over two hours to pipe. 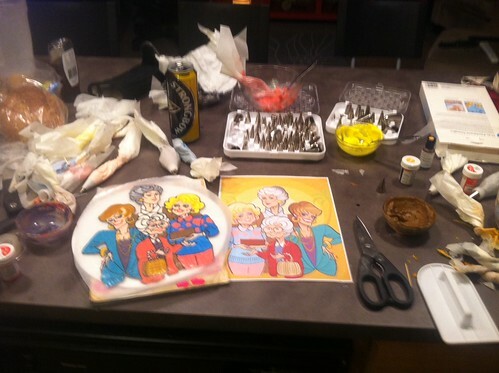 I have to create the image one color at a time, using different icing tips for different line thickness, color fills etc. I create the outlines first and fill in the colors from there. 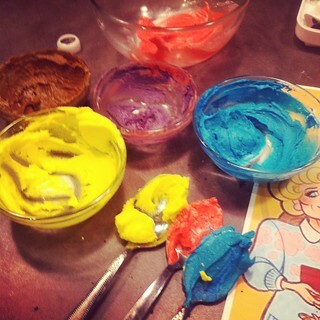 It’s a very intricate process! The cake I covered in blue fondant and then applied the transfer. I added fondant lace to the bottom. 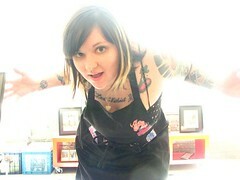 I have a special tool I use to make my lace… I created it by breaking a valentines day cookie cutter haha. So, over all, I’d say it was worth making the cake again. It was fun to put a new twist on it and it’s ALWAYS a challenge to make such a large butttercream transfer! 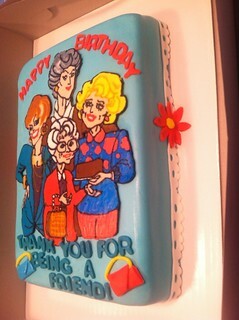 Some times I get to make super fun cakes! I jump at the chance to do any cool nerdy/geeky cakes. They’re always my favorite. 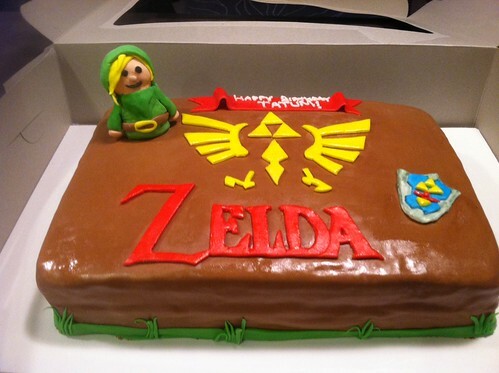 When I was asked to make a Zelda cake with a little Link figure, I was stoked. I’m going to call this cake the hella chocolate cake. Because it’s PACKED full of chocolate. I made dark chocolate cake full of chocolate chips, then I filled the layer between the two cakes with more chocolate chips and thick, rich chocolate buttercream. Next, I iced the whole cake in homemade chocolate buttercream and then covered it in home made chocolate fondant. I might be calling it hella chocolate, but this thing smelled like heaven. Let’s be honest. I wanted to take a bite. Whenever I get a project, I usually give it a nickname so that when I’m working on it, I can remember which cake I’m getting things for or baking for, need which pans for etc. Some times it’s something elaborate, but most of the time it’s pretty straight forward. 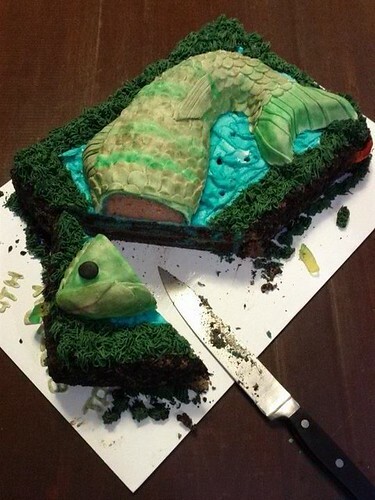 This was simply… the fish cake. 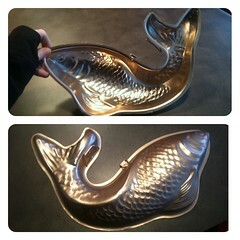 A while back, at least a year ago, but probably more like two, I saw this fish cake pan somewhere at a yard sale or a thrift store or something for like a dollar. I knew I had to have it. It sat in my cabinet forever, but I knew one day, it would get it’s chance to be filled with batter and baked to perfect fish perfect. 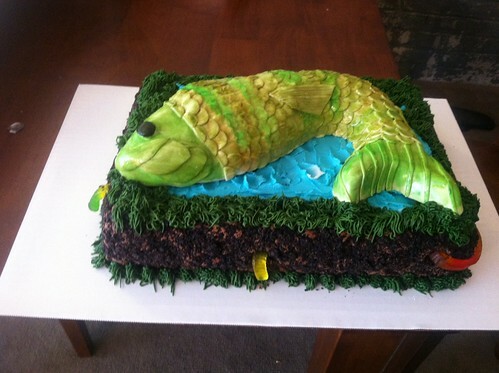 I iced the fish and then proceeded to cover it in scales… one scale at a time. I used an icing tip as a cutter and cut out what felt like a million little circles and laid them one at a time. One they were all laid, I added the other details and hand painted the entire thing with some diluted food coloring gels. 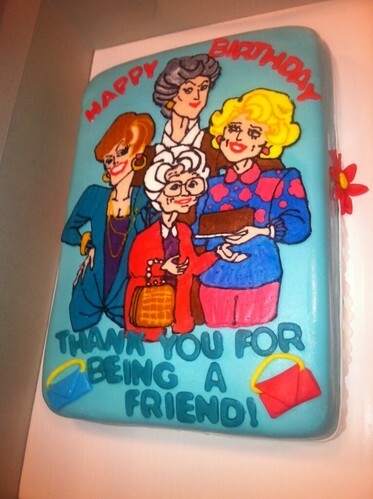 It was so great to get to see my friend again when she came to pick up the cake. We got to catch up on things for a while before she headed out, delicious cake in hand. Seems it was a big hit. 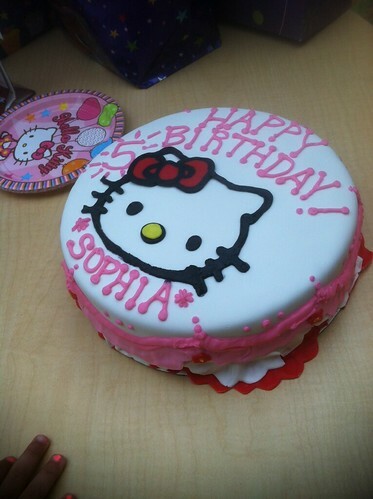 I mean, what kid doesn’t like cake covered in oreos and candy? I guess you cut the heads off of fish before serving. By the time I was finished looking at photos of fish and painting this thing, I’d decided fish were hideous aquatic troll creatures. I would probably still have taken a bite of this one though. 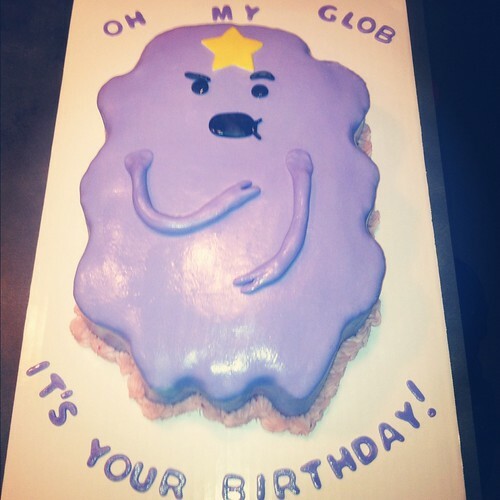 My friend: Hey, I was wondering if you could make Amy a Lumpy Space Princess birthday cake? Me: Yeah… I’m gonna need to google that. Haha. This thing was awesome. It was a strawberry half sheet cake packed full of a whole carton of strawberries. I carved out the shape of this delightful… creature and slathered it with strawberry buttercream and then covered it with fondant. I had found quite a few pictures of this character on google and I’d asked which face he wanted her to make. He told me to use whichever one made me smile. I thought this face was hilarious. haha. I’ve not seen Adventure Time, but I really want to check it out because this cake was a lot of fun to make!